We have entered another beautiful Summer on Panama City Beach. The fishing has been phenomenal, and looks to continue. Big amberjack kicked off the Summer for us in epic fashion. Red snapper are eager to feed. The bait has shown up in mass with the predators close behind. Tarpon are arriving in greater numbers daily, waiting to put on an aerial display. Blacktip sharks can be seen cruising the beaches of Shell Island, making incredible sight fishing opportunities. Call Capt. John Vann at (850)774-0909 to book your next fishing adventure with Last Local Guide Service. 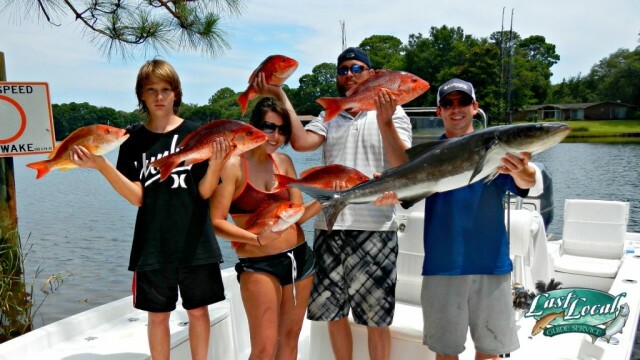 Panama City Beach fishing was perfection in Summer 2014! Panama City Beach fishing only gets better into the Fall! Let’s take a minute and reflect on the incredible fishing our clients did for the Summer of 2014! Amberjack are crushing topwaters on Panama City Beach! With A.J.s chewing everything in sight, we soon ran out of live baits and switched to big topwater plugs. The image of these bruisers blasting 8″ poppers on the surface is hard to beat! Red dawns light up Winter redfish on Panama City Beach! Recently spent the day chasing tailing redfish with good friend Capt. Sheven Arnold (Early Times Charters). Only sight fishing tarpon in my opinion could compare to the sport. Watching huge schools of redfish feeding at daybreak is incredible! Shark fishing on Panama City Beach is a blast! Shark fishing “Last Local” style means sight fishing! Nothing compares to watching sharks circle the boat in shallow water, anticipating a cast and hookup! Panama City Beach is a virtual fishing aquarium! Our beaches are no doubt a virtual fishing aquarium! This is definitely my favorite time of year on Panama City Beach. Sight fishing is at it’s peak with gin clear water and a host of beach marauders. Game on!